Life doesn’t stop once a PR agency has been acquired. Its CEO and entire staff become integrated into the buyer’s organization and life becomes quite different. Whether it’s a good or bad life depends upon many factors — culture, chemistry, synergy as well as the blending of best practices of seller and buyer. Learn from someone whose firm has been acquired and who can share that experience with PR agency CEOs who are thinking about selling at some point. 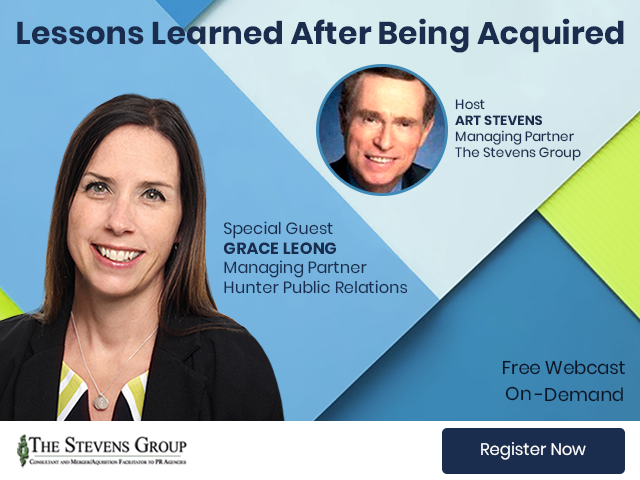 Grace Leong’s firm Hunter PR was acquired by MDC Partners several years ago. Learn from Grace firsthand how sellers can make being acquired work. Grace is one of the most respected agency heads in the industry. Here words of wisdom will teach you how and what to do to make being acquired exciting, stimulating, motivating and financially rewarding.